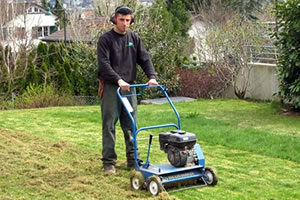 We have a Landscape Maintenance program to suit your needs; if we don’t we will create one for you. We can accommodate your needs through all seasons, as it is your garden after all, we are here to help. We do use herbicide when we consider it’s needed, but rest assured that the herbicide we use is not harmful to humans, pets or wildlife alike. Over the gardening season our aim is to improve your garden from the day we start, we aim to do all the normal maintenance and a little bit more each time we visit thought out the gardening season. So in spring time for instance, it is a good time for weeding and getting the garden ready for summer, early spring is a good time for pruning roses, and a good time for feeding the soil with compost. As we move in to mid spring it’s time to give your lawn some ‘feed and weed’ also just after that it’s time for its first lawn cut. Moving forward in to late spring is a good time to prune early flowering shrubs, this is also a good time to plant out half hardy annuals after the first frost. Onwards in to the summer yippee! The lawn will need cutting every visit by now also the hedges should be ready for a trim and its time for deadheading the early flowering roses ready for the next flush. Its really warming up now so it’s important to keep things watered, this is a job for you as its best done in the evening after the heat of the day. At this time of year we cut the lawns a little higher which helps to keep more moisture in the lawn which makes for a greener lawn. By now the weeds will be at their most rampant so keeping them under control will be a full time job. Time to start deadheading again now we’re getting in to late summer, autumn is on the way and the nights are getting cooler. Now the leaves are on the turn, its time to start packing the garden up for a long winter ahead, at this time of year is a good time to do some planting for next season whilst there’s still some heat in the soil. It’s now time to clean all the shrubs cutting back any dead stems. It will be getting colder now and moving into late autumn is a good time to mulch around the boarders and then on to collecting the leaves and composting them, leaf compost is great for your garden for the new season. So at this time of year that’s the end of our garden maintenance program, time to take our holidays now, we will be back again in early spring.